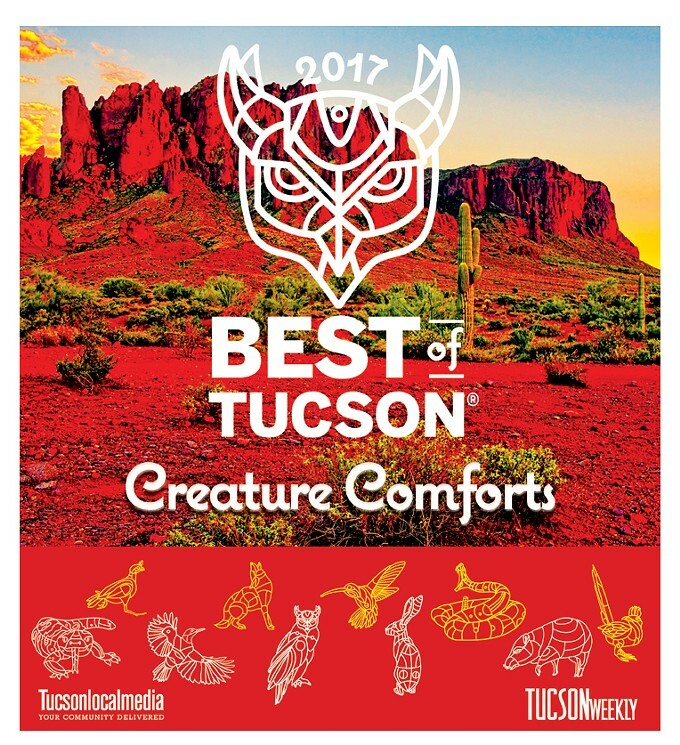 Welcome to the Best of Tucson® 2017, celebrating the creature comforts of our bustling little burrow. We depended on a whole bunch of industrious critters to put together the best guide of where to howl, forage and nest here in Southern Arizona. Christopher Boan, Logan Burtch-Buus, Emily Dieckman, Danyelle Khmara, Linda Ray and Brian Smith scratched out the words. Logan brought home the images, with help from Bandit Riveredge Photography and other friends. Art department ace Oliver Muñoz designed the cover as well as comfortable creatures who populate our pages, while Christa Madrid and Louis Armendariz worked the production end. Our UA Journalism School interns—Rocky Baier, Leah Gilchrest, Andrew Koleski and Tirion Morris—helped with a lot of the behind-the-scenes work to make sure everything stayed on track. The sales department, headed up by the capable Casey Anderson, ensured that we had enough support to publish this 800-pound gorilla again this year. Thanks to the reps for working their tails off: Kristin Chester, Candace Murray, Grace Heike, Lisa Hopper, Sandee Ficshlin, Tyler Vondrak, Tameron Wright. Back here in our Tucson Weekly warren, Jaime Hood and Kate Long kept all the paperwork in proper order. And managing everything from the initial ballot to the final pages was the real superstar behind BOT, production manager extraordinaire Chelo Grubb. Without her patient guidance—and somewhat deceptive deadlines—we don't imagine you'd be holding this in your hands right now. Now it's your turn. Dig in and enjoy!